A LeBron James rookie card, one of a kind, autographed, graded MINT 9 by PSA. Goldin Auctions is very proud to have set another sports collectibles record with this beautiful example of basketball card history with a staggering $312,000 sale in 2016. The 2003-2004 Upper Deck Ultimate Collection LeBron James 1/1 "Ultimate Logos" Autographed Logoman Rookie Card is exquisite. It's the most valuable LeBron James card in the world, worth triple the previous high price paid for a James card. It's also the single most valuable signed basketball card and the third most expensive basketball card ever behind the vintage card records of the 1969 Lew Alcindor Topps rookie card and 1948 George Mikan rookie card. Why is this LeBron James Rookie Card so Special? The beautiful rookie card from Upper Deck's Ultimate Collection, which were originally sold for $125 per pack with only four cards in a pack, includes an NBA logo patch removed from a jersey James wore for a rookie year photoshoot. That alone is really something. It's one of a kind. Add to that a gorgeous autograph when few of Lebron James' rookie cards were autographed at all, a strong collectibles market, a brilliant career so far, and you've got basketball gold. This is a significant sale not just because of the final sale price, though. It makes a strong statement about both basketball collectibles and modern sports cards. When most people think of sports collectibles, they likely think of vintage baseball. The record setting sales we've had for Mickey Mantle cards and the Holy Grail Honus Wagner card are examples of why that's probably the first thought, but with the recent record-setting sale of the modern hockey giant, Wayne Gretzky, and now with this even more recent card from Lebron James' rookie year, the appeal of modern sports cards is undeniable. 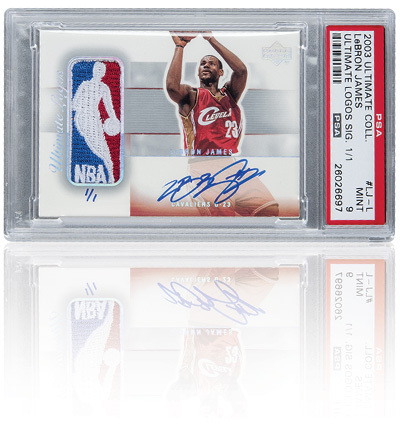 Lebron James' rookie card from the 2003-2004 Upper Deck Ultimate Collection is telling the world that basketball collectibles and modern collectibles as a whole are here, they're strong, and they're welcoming a whole new age of collectors. The reigning king of basketball, LeBron James is more than a face on a rookie card. He's a true story of a kid who took raw talent and worked it, practiced, and invested the hours to become great. Then, when everyone knew he was great already, he kept working, kept refining his game between seasons. He came onto the scene as the first overall pick in 2003 by the Cleveland Cavaliers. No one was surprised. His talent was already much buzzed about. He scored a huge 25 points in his first professional game, and earned the title of NBA Rookie of the Year. In 2006, he was named the NBA All Star MVP and led the Cav's to their first appearance in the NBA Finals in 2007. In 2010, he left the Cav's to join the Miami Heat where he played for four seasons reaching the Finals all four years and winning back-to-back championships in 2012 and 2013, having led the Heat to a 27 game winning streak in 2013. James then returned to the Cav's to lead them to two consecutive Finals in 2015 and 2016 and the championship title in 2016. James' records and accomplishments on the court are substantial. His scoring power is legendary. He's a champion, an Olympian, a king of his sport. Off the court, LeBron James is just as beloved. Generally accepted as "the face of the NBA", he is also an accomplished businessman and a philanthropist. He's a prominent supporter of The Boys and Girls Club of America, Children's Defense Fund, and launched his own charity, The LeBron James Family Foundation which raises money for various causes including scholarships in partnership with the University of Akron, Wheels for Education, The Promise Project in Akron, and many more. He's a man who clearly chooses to use his position to create good. He's a beast on the court. And he isn't overly free with his autographs. What's not to love?